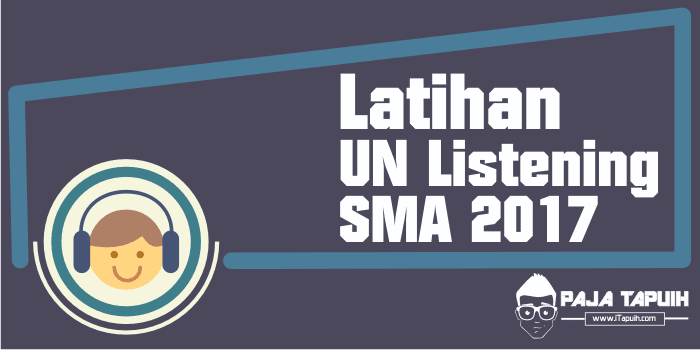 iTapuih.com - Latihan : Soal Listening UN SMA 2017 Beserta Pembahasan. Listening adalah satu skill yang ada dalam pelajaran bahasa Inggris, dalam penyampaian materi ajar bisa disajikan secara langsung oleh guru ataupun melalui media seperti musik atau film. Listening merupakan materi yang penting dalam pembelajaran bahasa Inggris karena kita akan mendengarkan apa yang orang lain (Native Speaker) ucapkan kepada kita. Dalam soal Ujian Nasional, soal Listening merupakan salah satu komponen soal yang selalu ada dari tahun ke tahun. Berikut bentuk soal (Transcript Listening UN SMA 2017) lengkap dengan audionya. Silahkan uji kemampuan Listening anda dengan mengikuti langkah-langkah sebagai berikut. Dengarkan audio pada video berikut. Pilihlah jawaban yang tepat dengan mengklik salah satu option yang benar. Jika ingin melihat pembahasan dari soal-soal listening berikut, silahkan klik pada link yang ada dikolom paling bawah postingan ini. carefully to understand what the speakers are saying. After you listen to the dialogue and the question about it, read the five possible answers, and decide which one would be the best answer to the question you have heard. Now listen to a sample question. Woman: Didn't Kathy go travelling to Japan with you last month? Man: Are you kidding? Even if it didn't cost anything, she'd rather stay at home. Narrator: What does the man think about? C. Kathy is a thrifty woman. E. Kathy is an extravagant woman. Narrator: The best answer to the question "What does the man think about Kathy?" is the “Kathy is a stay at home woman.” Therefore you should answer (D). ln this part of the test, you will hear some incomplete dialogues spoken in English, followed by four responses, also spoken in English. The dialogues and the responses will be spoken twice. They will not be printed in your test book, so you must listen carefully to understand what the speakers are saying. You have to choose the best response to each question. Now listen to a sample question. Man: Hi, Nancy. What are you doing here? Are you waiting for m one? Woman: No, I'm waiting for a taxi. I want to go to a book store. Narrator: What is the best response to the woman's statement?? B. I'll find a good book for you. Narrator: The best answer to the question "What is the best response to the woman's statement" is "Let me take you to the book store." Therefore you should choose answer (A). In this part of the test, you will hear some dialogues or monologues spoken in English. The dialogues or monologues will be spoken twice. They will not be printed in your test book, so you must listen carefully to understand what the speakers are saying. After you listen to the dialogue or monologue, look at the five pictures provided in your test book, and decide which one would be the most suitable with the dialogue or monologue you have heard. In this part of the test, you will hear some monologues. Each monologue will be spoken twice. They will not be printed in your test book, so you must listen carefully to understand what the speakers are saying. After you hear the monologue and the question about it, read the five possible answers and decide which one would be the best answer to the question you have heard. Question 12 and 13 are based on the following monologue. Question 14 and 15 are based on the following monologue. Selamat belajar, semoga postingan tentang Soal Listening UN SMA 2017 Beserta Pembahasan bisa bermanfaat dan jangan lupa share ya.